Создавайте четкие изображения без артефактов или ореолов. Sharpen AI — это первое программное обеспечение для повышения резкости и уменьшения вибрации, которое может определить разницу между реальными деталями и шумом. Создавайте четкие изображения даже при съемке с рук, ночью или с малой глубиной резкости. Sharpen AI was trained with millions of images so it could learn the characteristics of detail vs. noise - and then enhance just the detail. 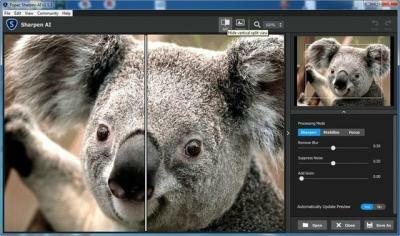 In some cases, it can even recover image detail. Through continuous AI training, Sharpen AI's enhancement model becomes both faster and higher-quality with time. You’ll get the latest and greatest when the model improves. Even the steadiest hands don't compare to a tripod when it comes to image sharpness. Unlike a tripod, though, you always have your hands with you! Sharpen AI's Stabilize module has been trained to reverse motion blur and make handheld images look like they were taken from a tripod. Focus correction is a notoriously difficult problem that's easy to get wrong, but Sharpen AI's Focus module excels at correct up to ten pixels of focus blur. This is perfect for sharpening out-of-focus eyes or correct issues caused by incorrect in-camera focus. Tip: use selective adjustments for best results! Even with no motion blur or focus issues, images generally come out of the camera soft. Sharpen AI includes the Sharpen module that specializes in correcting small amounts of general softness without any artifacts or halos. It's the most natural-looking sharpening tool that you will ever use. The perfect time to make images tack-sharp. The need for sharpening is universal: most images come out a little soft straight out of the camera. Here’s just a handful of use cases in which we’ve seen exceptional results with Sharpen AI. You can pose people, but it’s much harder to ask animals to stay still! Use Sharpen AI’s Stabilize module to correct camera shake and the inevitable motion blur you get from fast-moving subjects. It’s also difficult to focus perfectly in these situations, so the Focus module will also be very useful. This applies to any photos with fast-moving subjects – not just animals! Adjust the slider to the left to see the difference at 100%, or click for a larger before/after. No matter how fast you set your shutter speed, you can’t shoot handheld landscapes as sharp as if you had a tripod. You don’t always have a tripod with you, though. Sometimes you don’t even have the luxury of using a fast shutter speed. Sharpen AI’s Stabilize module helps you get handheld images that look like they were taken from a tripod. This model was trained specifically to counteract motion blur caused by camera shake and can produce some pretty exceptional results in your photos. Getting sharp portraits is essential. Using controlled lighting and tripods in a studio setting is a good way to do that, but you’re not always in a studio. Use Sharpen AI when the otherwise perfect portrait has slightly out-of-focus eyes or camera shake. A new approach to sharpening. We believe that better technology enables you to produce better art. The photos that thousands of other photographers have created with AI technology have been astounding, and we can’t wait to see what you create. Here’s how it works. The first step of the machine learning process is to teach the software what sharpness is. We do this by feeding millions of blurred/sharp image pairs into the software and asking it to learn the characteristics of what makes an image sharp. Just like computers perform math and complex operations faster than humans, they can also learn much faster for very specific tasks. Sharpen AI soon understands how sharp images generally become blurred, and therefore how to reverse the process. Sharpen AI performs millions of operations per pixel, so a significant amount of work is done to speed it up. This whole process continues even after the product's release: you'll likely see new updates with sharpening model improvements as the software learns more.